So many stacks, so little time. 7 reasons why you should learn Java. This article was originally published in 2017, with updates made in 2019. “What is the best programming language” is one of the most heated debates in the software engineering industry. Everyone has their own opinion, and frankly, it’s all completely subjective based on the coding one enjoys. If you’re not sure, take some free online classes through Codecademy or Udemy to try out different languages. You can also consider the types of companies you want to work for, and research which languages they use. With more than 250 programming languages in use today, and coding bootcamps teaching more than 100, at CodingNomads we teach Java because we’ve seen firsthand how versatile, transferrable, and in-demand Java is across the world. Learning Java changed our lives for the better, and we’re passionate about sharing these valuable skills with our students. Keep reading to find out why learning Java could be one of the best decisions you ever make. 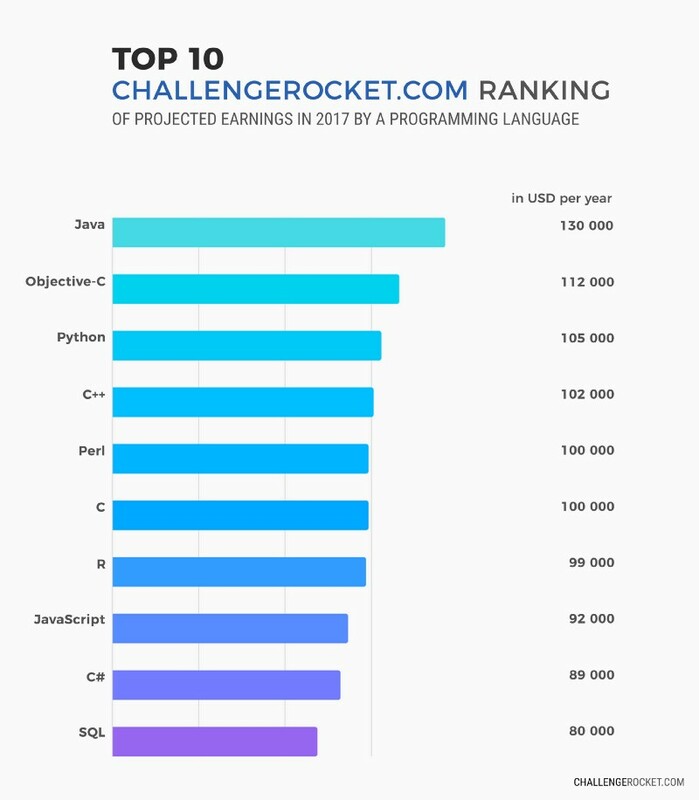 Every year CodingDojo ranks the programming languages in highest demand based on the number of job listings on the world’s largest job aggregator, Indeed.com. This year we followed suit to compile the top 10 languages for 2019. 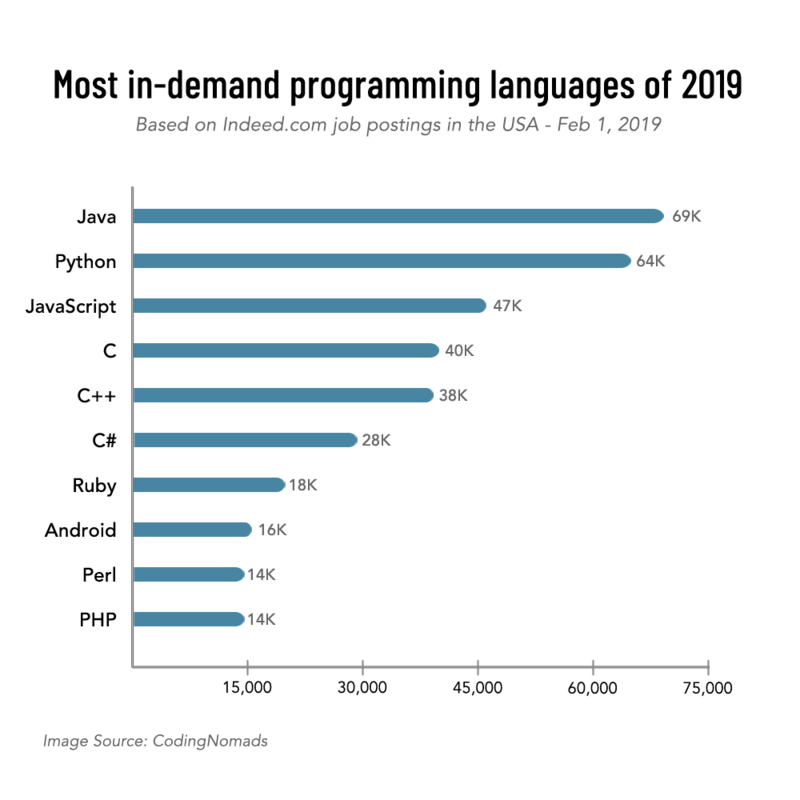 In line with Java’s #1 ranking found by CodingDojo in 2016 and 2017, Java remains the most in-demand programming language for 2019. 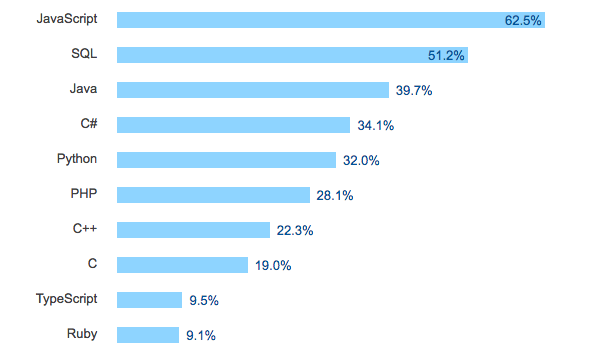 Android developer jobs also rank in the top 10, with Java as the base language used for native Android apps. Not included on this graph is SQL, as it’s not technically a programming language but a database query language. Also part of CodingNomads’ curriculum, SQL has more than 92,000 job postings on Indeed.com, and is a required skill for any software engineer. These statistics only represent the US market, with undoubtedly tens of thousands more Java and SQL jobs available worldwide. By learning a combination of Java and SQL at our bootcamps, CodingNomads students are prepared with skills that are in the highest demand of any other language, year after year. Java was created in 1995 by Sun Microsystems as a platform-independent, open-source language embedded in various consumer electronics. Eventually Sun Microsystems was acquired by Oracle, with Java as the prized possession. Known for its security, versatility and its portability to run on any operating system, Java quickly became (and has remained) a game-changing technology used across various devices and sectors. What types of companies use Java? Java is used by companies in tech, government, finance, healthcare, insurance, education, manufacturing, defense and more. 90 percent of Fortune 500 companies use Java for their backend architecture. Yet because of its speed and scalability, many startups facing rapid growth use Java to power their tools too. According to iDataLabs, 70% of companies that use Java are small (<$50M in revenue), 13% are medium-sized ($50M - $1000M), and 7% are large (>$1000M). In 2016 Oracle estimated that Java runs on over 3 billion devices worldwide – more than any other language. A virtually omnipresent language, it’s used in devices such as smartphones, automobiles, medical devices and E-readers, as well as many of the world’s most prominent websites like eBay, Linkedin, Amazon, Facebook and Google. Java is used for the Internet of Things and APIs, in big data technologies, e-commerce websites, high frequency financial trading platforms, scientific applications, and more. As mentioned, Java powers Android, which is the most widely used operating system on earth. Java is the brains behind Gmail, and is even in the Curiosity Rover on Mars. Java is so widely used, that a video spoof was created depicting a doomsday scenario of what the world would be like without Java. It’s a bit silly, but exemplifies the depth and magnitude of influence Java has on our world. According to Payscale.com, the median entry-level salary for Java developers is $65,446. With a few years of experience, Java developers can expect to meet and exceed $100,000 per year. While salaries vary by company and location, Java developer salaries are consistently competitive with other common language developer salaries. The following analysis from ChallengeRocket places Java at the top. In 2016 Oracle estimated that there are more than 9 million Java developers worldwide. Any developer can tell you the immense role the programming community plays in their ongoing education. When you are stuck, you turn to Stack Overflow, a programming question and answer platform. When you are curious, you browse code repositories on Github. The growth and success of any programming languages depends on its community of developers eager to share knowledge. Without this support system, a language simply wouldn’t survive. Github is where developers store project code and collaborate with other developers. Java has the most active repositories and developers of any programming language, with more than 660,000 Github repositories associated with Java, and 39,000 active Java developers. The TIOBE Index ranks the popularity of programming languages based on quantity of search queries across 25 search engines. Year after year, Java is the #1 most searched programming language, demonstrating its continued popularity and interest worldwide. Whether you want to build your career at a large corporate firm or at an exciting new start-up, the community of Java developers will play a critical role in your growth as a professional. With Java, you’ll have thousands of trained and experienced mentors just a click away. Many aspiring software developers want to learn the newest, hottest technologies. However in such a fast-paced, evolving industry, you don’t want to spend time and money learning a language that will be outdated in a few years. With more than 20 years of widespread use across companies large and small, Java will undoubtedly remain in demand for the generation to come. Additionally, after you learn Java, learning other languages becomes much quicker and easier. This is why Java is often the core programming language taught in many university Computer Science (CS) programs throughout the world. While the first language you choose to learn doesn’t necessarily dictate the language you’ll specialize in forever, making an informed and strategic decision will set you up for immediate and long-term success. Learning a versatile language like Java opens the doors to jobs in all fields of the booming tech economy. Understanding that not all students know what kind of job they want upon completion of our Java coding bootcamp, we prepare students with a solid foundation that paves the way for ample work opportunities upon graduation. The breadth and depth of companies using Java gives it serious staying power. Java evolved from the languages C and C++, which are also still widely used today. While Java shares some functionalities with C and C++, it has evolved into a much more beginner-friendly language. For example, Java handles many of the tedious, complex tasks such as memory management and pointers, making it easier to write and run for new programmers. Java brings an Object-Oriented approach to programming, which allows even the newest Java developers to start modeling the world around them in code, and thinking like a developer. While Java is sometimes criticized for being verbose and inflexible, these traits can actually benefit new programmers. Because Java is checked for errors before running, new developers are less likely to come across unknown runtime errors. Additionally, Java forces developers to define all aspects of their code carefully, leaving less room for errors as programs grow. For aspiring software developers who want to stand out from the rest, learning a server-side programming language like Java will achieve this, and make you eligible for tens of thousands of server-side programming jobs. So doesn’t that mean that Java bootcamp grads are now in competition with university CS graduates? In short, yes. However our curriculum goes far beyond what you learn in university. While a university degree is always an asset for finding work, unfortunately today, university programs do not adequately equip their grads with the day-to-day skills needed as a working software engineer. When CodingNomads’ Lead Instructor Ryan Desmond got his first job after obtaining his CS degree, he had to learn practical software engineering tasks on the job, and on the fly. As employers today value the work you can do over the credentials you have, our job-focused curriculum helps successful Java bootcamp students stay competitive, even with university graduates. Our curriculum is curated to teach critical Java fundamentals taught at universities, coupled with the real-world career skills of API development, SQL database management, and Amazon Web Services (AWS) server infrastructure. Our curriculum also integrates widely used project management and collaboration tools used by professional engineering teams. From our years in the professional workforce, we know firsthand that this well-rounded combination of skills are needed by employers today, and will differentiate CodingNomads students from the rest. 2 Comments On So many stacks, so little time. 7 reasons why you should learn Java.